Heat up a pan with some oil (about 1 table spoon depending on the size of the pan. Use more if neccesary) with medium fire. Spread the oil evenly as the pan becomes hot. Pour 1/3 of the mixed egg ingredients into the pan, spread it evenly. Pour some more oil again to the empty space of the pan and spread it evenly. Pour 1/3 of the egg to the empty space. 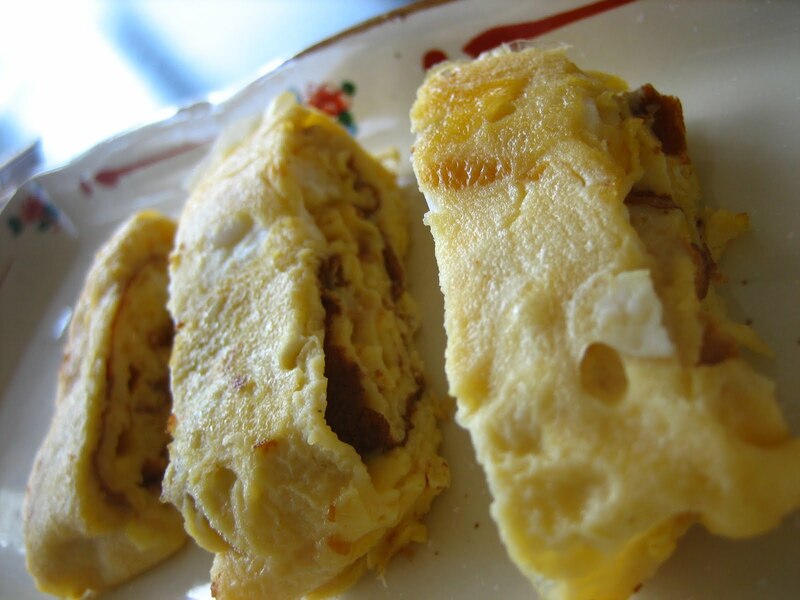 Spread it evenly and make sure that the newly poured egg touches the cooked egg roll. Once the egg is settled (After 5 seconds!) , fold the egg 2 times away from you. Pour some oil again to the empty spot and spread it evenly. Pour the last 1/3 of the egg and spread it evenly. Once settled, fold it 2 times towards you. Slice it after let it cool down a bit.